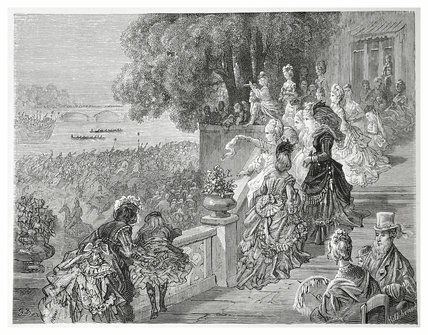 An illustration of people at The Limes, Mortlake, watching the Oxford and Cambridge Boat Race, from 'London: a Pilgrimage' by Blanchard Jerrold and Gustave Doré, 1872. Jerrold describes how 'the towing paths presented to the view of the more fortunate people upon the private river-side terraces, a mixed population ...'. The Limes, at 123 Mortlake High Street, is a grade 2* listed building, built around 1720. The lime trees after which the house in named feature in a pair of paintings by JMW Turner, painted in 1827.